Massive amounts of data have been generated by the first "Big Data" global project for Alzheimer's disease, called the Alzheimer's Disease Neuroimaging Initiative (ADNI). Discover how the data will be made freely available to researchers worldwide to quickly advance Alzheimer's science. In a tremendous stride forward, more than 800 people enrolled in the Alzheimer's Disease Neuroimaging Initiative (ADNI). 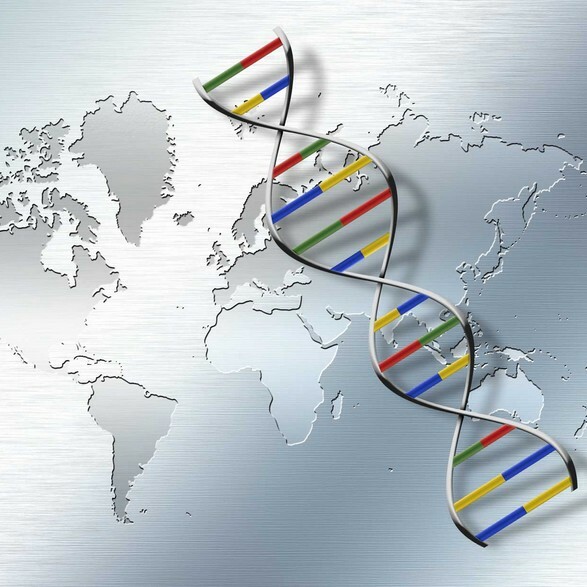 With their help, the project obtained whole genome sequences on the largest cohort of individuals related to a single disease. The genome sequencing data – estimated to be 200 terabytes – will be housed in and available through the Global Alzheimer's Association Interactive Network (GAAIN), a planned massive network of Alzheimer's disease research data made available by the world's foremost Alzheimer's researchers from their own laboratories. GAAIN is funded by an initial $5 million dollar investment by the Alzheimer's Association, made possible due to the generous support of donors. "The Alzheimer's Association is committed to creating open access to research data, and we believe GAAIN will transform how neuroscience data is shared and accessed by scientists throughout the world," said Maria Carrillo, Ph.D., Alzheimer's Association vice president of Medical and Scientific Relations. "By fostering a higher level of global data sharing, GAAIN will accelerate investigation and discovery in Alzheimer's through a system comparable to a search engine like Google or Bing for relevant data." "With the addition of more than 800 whole genomes on ADNI subjects that can be linked to the current rich dataset, ADNI data will be even more useful to scientists who are seeking new approaches to treatment and prevention of Alzheimer's disease," said Robert C. Green, M.D., M.P.H., of Brigham and Women's Hospital and Harvard Medical School, who led the ADNI sequencing project. "ADNI is a leader in open data sharing, having provided clinical, imaging and biomarker data to over 4,000 qualified scientists around the world, which has generated over 700 scientific manuscripts. Whole genome sequencing determines all six billion letters in an individual's DNA in one comprehensive analysis. The raw data from the ADNI project is being made available to qualified scientists around the globe to mine for novel targets for risk assessment, new therapies, and much-needed insight into the causes of the fatal brain disease. The new data may enable scientists to better understand how our genes cause and are affected by bodily changes associated with Alzheimer's disease. ADNI enrolls people with Alzheimer's disease, mild cognitive impairment, and normal cognition who have agreed to be studied in great detail over time. The goal is to identify and understand markers of the disease in body fluids, structural changes in the brain, and measures of memory; the hope is to improve early diagnosis and accelerate the discovery of new treatments. ADNI is led by Principal Investigator Michael W. Weiner, M.D., of the University of California San Francisco and the San Francisco VA Medical Center. Dr. Green collaborated on managing the sequencing efforts with Arthur Toga, Ph.D., of UCLA and Andrew J. Saykin, Psy.D., of Indiana University. The actual genome sequencing was performed at Illumina, Inc.
ADNI is a public-private research project led by the National Institutes of Health (NIH) with private sector support through the Foundation for NIH. Launched in 2004, ADNI's public-private funding consortium includes pharmaceutical companies, science-related businesses, and nonprofit organizations including the Alzheimer's Association and the Northern California Institute for Research and Education. Data-sharing has already greatly benefitted scientific disciplines such as genetics, molecular biology, and the physical sciences. Data-sharing in genetics has led to dramatic advances in understanding the risk factors underlying complex diseases. The Alzheimer's Disease Neuroimaging Initiative (ADNI) is a compelling example of dozens of geographically-dispersed researchers working together to share their data while making it freely available to others for analysis and publication. "GAAIN is similar in spirit and goals to other ‘big data' initiatives that seek to greatly improve the tools and techniques needed to access, organize, and make discoveries from huge volumes of digital data," Carrillo said. "The advent of cloud computing makes it possible to link databases throughout the world and expand their data processing capability significantly to benefit the research community." Carrillo will supervise the development of GAAIN in conjunction with co-principal investigators Art Toga, Ph.D., of the Laboratory of Neuro Imaging (LONI) at the University of Southern California and Giovanni Frisoni, M.D., of the National Center for Alzheimer's Disease Research and Care and the Instituto di Ricovero e Cura a Carattere Scientifico (IRCCS), Fatebenefratelli Hospital, Italy. Enrique Castro-Leon, Ph.D., who will serve as a consultant, is an enterprise and data center architect for strategic partner Intel Digital Enterprise Group. The key to GAAIN's innovation is its federation of data, which is unprecedented for such a system. GAAIN leadership will invite scientists conducting qualified studies to become partners by permitting GAAIN to link directly to their databases. This will enable researchers to add continually to their data sets and keep all data in GAAIN current and dynamic. It also will enable the scientists to retain control over access to their data, which the Association believes will be important to encouraging participation. "This is unprecedented and of the utmost importance in brain research, where sometimes thousands of examples are required to observe even the smallest change in the brain," said Giovanni Frisoni, M.D., neurologist and deputy scientific director at the National Center for Alzheimer's Disease Research and Care at the IRCCS. He will lead the work of GAAIN in Europe. "Through GAAIN we envision combining massive amounts of data from multiple sources across many subjects participating in numerous studies," said Art Toga, Ph.D., professor of neurology at UCLA and director of LONI. "This will provide more statistical power than ever before." The Brin Wojcicki Foundation was established by Sergey Brin, the co-founder of Google and Anne Wojcicki, the co-founder of 23andMe, a leading personal genetics company. The Brin Wojcicki Foundation's mission is to effect world change in Parkinson's research and neurodegenerative diseases, to support individual rights and freedom from oppression, to develop opportunities for those in need in poverty, health and education and to support transformational and disruptive research. Launched in 2004 by the NIH as the largest public-private partnership supporting Alzheimer's research, the original goal of Alzheimer's Disease Neuroimaging Initiative (ADNI) was to define biomarkers for use in clinical trials and determine the best way to measure treatment effects of Alzheimer's. Now in its third phase (ADNI 2), the goal has been expanded to include the use of biomarkers to detect Alzheimer's at a pre-dementia stage. Results from ADNI are expected to provide researchers with a better understanding of Alzheimer's progression in its earliest stages, when treatments may be the most effective. The ADNI study is taking place at 55 major academic medical centers and clinics in North America and the model is being adopted in other countries worldwide. For additional information, please visit www.adni-info.org or www.nia.nih.gov/adni2.